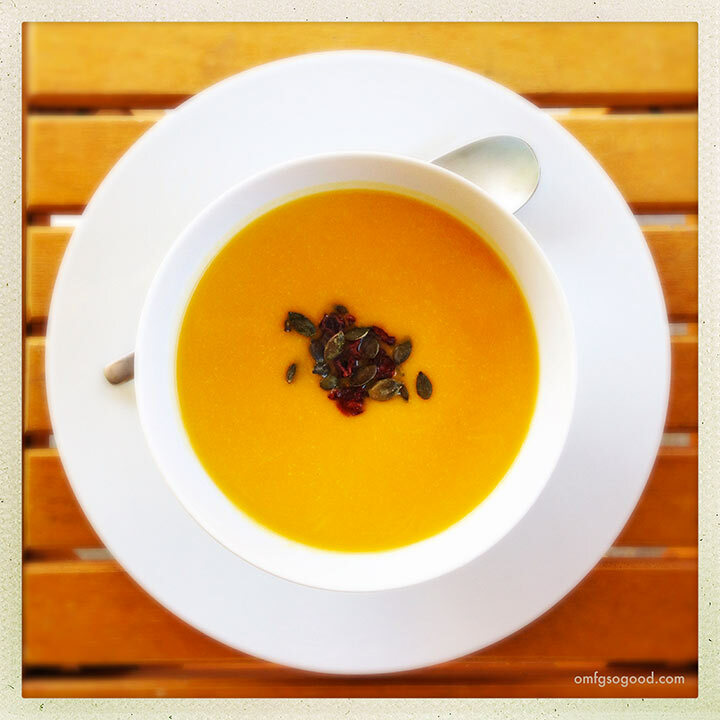 roasted butternut squash, ginger and apple soup | omfg. so good. I’m talking, ‘If I gave you a gently worn Armani suit in exchange for a dinner out, then all I ordered was this soup because I was still full from the hot dog I ate earlier in the day, I’d consider our deal square’ kind of good soup. No additional meal required. Aaaaand, there’s my Seinfeld reference for the day. Seriously though, it’s pretty fantastic. Roasting the butternut squash with ginger, sage, garlic (and a tiny bit of brown sugar and butter) makes for an intense base flavor. And, because it softens while roasting, you don’t have to go through the hassle of peeling and cubing hard, raw squash then boiling it down before you even get started. Combine that with tart granny smith apple, onion and a splash of cream, then top it all off with roasted pumpkin seeds (pepitas) and dried cranberries? Um, sure. I’ll have it. All of it. Preheat the oven to 400 degrees. Line a sheet pan with parchment paper and set aside. Cut the squash in half lengthwise, then scoop the seeds out and set the squash on the prepared pan, skin side down. 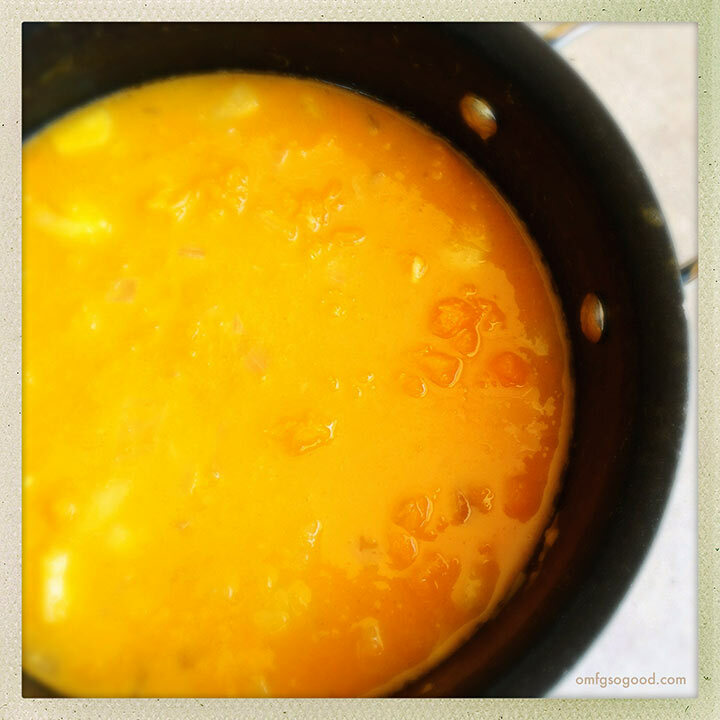 Divide 3 tbsp of the melted butter, pouring evenly into the cavities of each half of squash. Add the brown sugar, along with the grated ginger, the garlic, the sage leaves, and a sprinkle of salt. 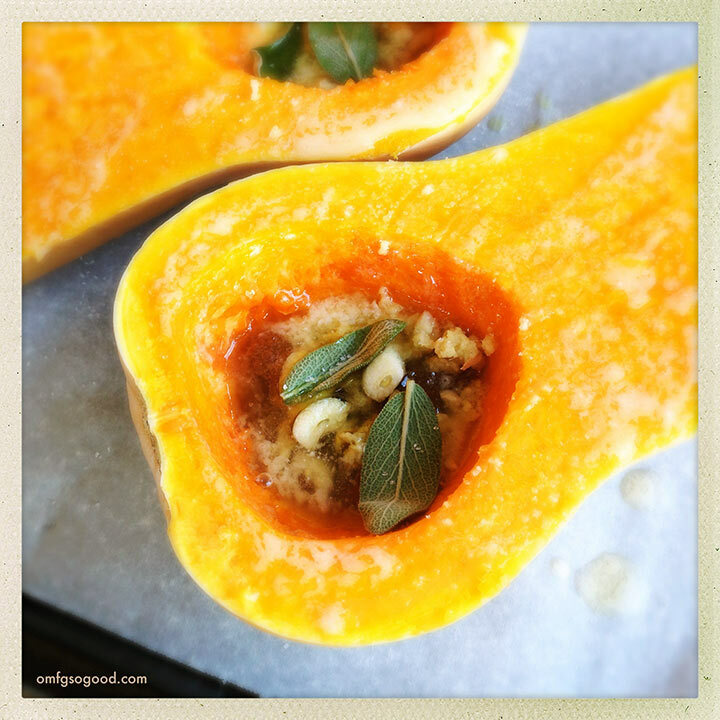 Roast the squash in the preheated oven for 35 – 40 minutes, or until fork tender. Scrape the roasted squash from the peel (along with all the other roasted goodness) into a large bowl and set aside. 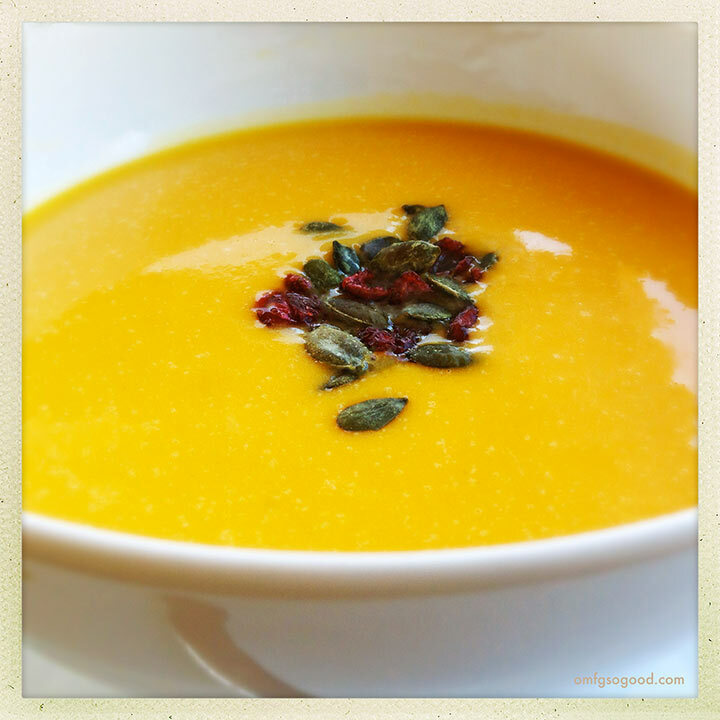 Transfer the soup in batches to a blender and puree until silky smooth. (Very carefully. Hot liquids will blow UP in a blender if you don’t let a little air in, so be sure to leave the ventilation cap off and cover with a dish towel when blending.) Once it’s all blended, pour the soup back into the pot, add the water and simmer for 5 – 10 additional minutes then stir in the cream. 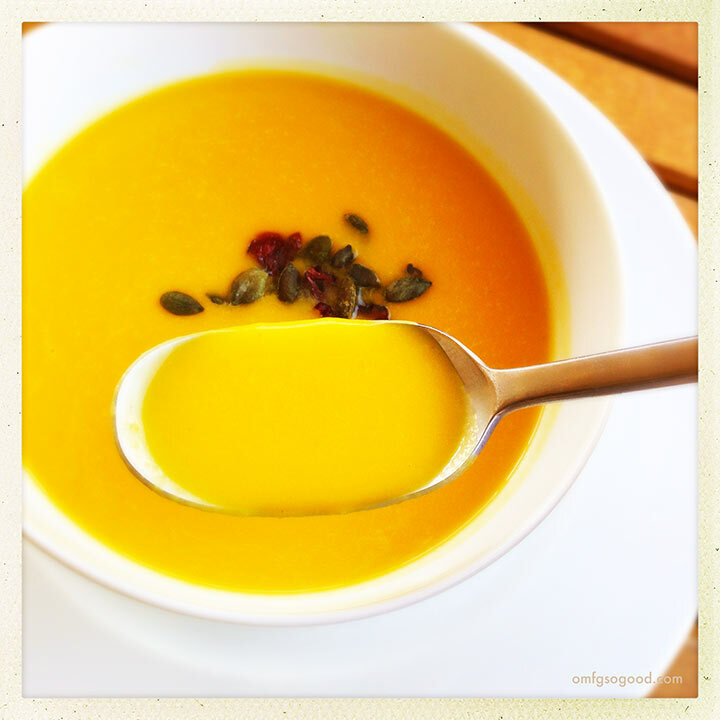 To serve, ladle into individual bowls and top with roasted pumpkin seeds (pepitas) and dried cranberries. If that doesn’t scream “FALL IS HERE” I don’t know what does. Oh, and did I mention the silky smooth texture? Wow. I mean, it’s no full meal of food at Mendy’s… but I’m sure it would be Bania approved.